Rhinopalpa polynice is found in SE Asia from Thailand to Indonesia. 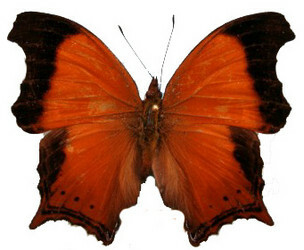 There are many subspecies described for the species, mainly from the Indonesian islands. Not much is known about the ecology of this species. Its larvae feed on host plants in the family Urticaceae. According to Wahlberg (2006) Rhinopalpa polynice diverged from its sister species (the African Vanessula milca) some 45 million years ago. Quite likely, the ancestor of Rhinopalpa colonised Asia from Africa, although how it did so is not clear yet. A molecular study of the island populations of Rhinopalpa would be informative of the evolutionary history of this distinctive yet enigmatic species. Wahlberg, N., 2006. That awkward age for butterflies: insights from the age of the butterfly subfamily Nymphalinae. Syst Biol 55, 703-714. Wahlberg, N., Brower, A.V.Z., Nylin, S., 2005. Phylogenetic relationships and historical biogeography of tribes and genera in the subfamily Nymphalinae (Lepidoptera: Nymphalidae). Biol J Linn Soc 86, 227-251. Page: Tree of Life Rhinopalpa polynice (Cramer 1779). Authored by Niklas Wahlberg. The TEXT of this page is licensed under the Creative Commons Attribution License - Version 3.0. Note that images and other media featured on this page are each governed by their own license, and they may or may not be available for reuse. Click on an image or a media link to access the media data window, which provides the relevant licensing information. For the general terms and conditions of ToL material reuse and redistribution, please see the Tree of Life Copyright Policies.